New York City is no stranger to ghostbusting or gentrification and If There’s Something Strange In Your Neighbourhood… features both of these on the other side of the globe – a real life Ghostbuster from Yogyakarta, Indonesia who resides in a squatter settlement that is currently being developed. 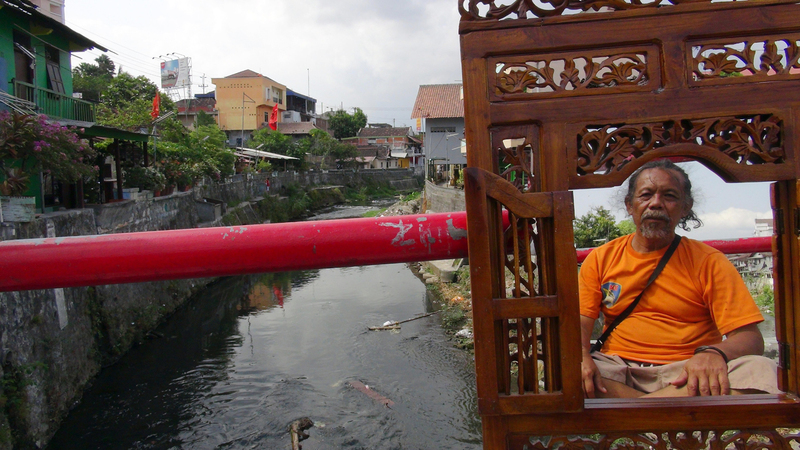 If There’s Something Strange In Your Neighbourhood… explores the gentrification of this settlement, built on top of a graveyard alongside Yogyakarta’s main river, Kali Code. In 2013 the local mayor announced he wanted to develop this area and local residents who have been squatting there since the 70s, have already started being pushed out. Due to the history of this place, tombstones are still visible in the walls of the kampung (neighbourhood) and ghost activity is abundant. Throughout Java ghost-moving (or busting) is an ancient and an important role in a community and for years people in the area have relied heavily on the local ghost mover to move the ghosts out of their houses, but these paranormal evictions are now becoming an uncanny parallel for their own evictions in the living world. If There’s Something Strange In Your Neighbourhood… is an Asialink Arts Residency Project supported by Arts NSW and supported by the Commonwealth through the Australia- Indonesia Institute of the Department of Foreign Affairs and Trade. Keg de Souza is an Australian artist working with mediums such as inflatable architecture, food, mapping and dialogical projects to explore the politics of space. This investigation of social and spatial environments is influenced by her formal training in architecture and experiences of radical spaces through squatting and organizing. Some of the things she creates are; tiny handmade glow-in-the-dark zines to giant inflatables, in between videos, picnics, walking tours, building boats and brewing beer. Recent exhibitions include; the 5th Auckland Triennial, 15th Jakarta Biennale and Vertical Villages at 4A Centre for Contemporary Asian Art, Sydney (all 2013), Temporality in Architecture, Food and Communities, Delfina Foundation, London and Temporary Spaces, Edible Places, Atlas Arts, Isle of Skye, Scotland (2014) and If There’s Something Strange in Your Neighbourhood… Alaska Projects, Sydney and Temporary Spaces, Edible Places: Vancouver, Contemporary Art Gallery, Vancouver (all 2015). She is currently an Australia Council for the Arts Creative Australia Fellow. Thursday August 13th Dinner at 7 pm. Presentations begin at 8:30 pm.